When Doug Schneider approached me about reviewing Mirages OM Design OMD-15 for Ultra Audio, I wondered if, given the fact that it retails for only $2500 USD per pair, this speaker was indeed "ultra" enough. But, as Doug pointed out, Ultra Audio isnt only about expensive components; its also about products that are distinctive and unique. And with their Omniguide technology, Mirages Omnipolar speakers qualify as unique. On SoundStage! AV, Doug had praised the top of the Mirage line, OM Design OMD-28, as "a first-rate loudspeaker in every respect." However, at $7500/pair, the OMD-28 is beyond the reach of many audio enthusiasts. The OMD-15 isnt exactly inexpensive, but its far more affordable. I was surprised at the large difference in price between the two models, but I presume that Mirage wants to use the OMD-15 to bring their OM Design sound to a much larger audience. After reading Dougs review of the OMD-28, and having enjoyed the sound of earlier Mirage designs, I was anxious to see how good an OM Design speaker Mirage could produce for only a third the price. Mirages early bipolar designs were basically conventional speakers with a difference: they had identical complements of drivers on the front and back of the cabinet, wired in-phase so that both driver arrays simultaneously reproduced the same signal but in opposite directions. Mirages current, Omnipolar speakers are descended from those original bipolar designs, with the addition of Mirages Omniguide, which disperses the sound in more of a full 360-degree pattern. The Omniguide module consists of an upward-firing midbass driver and tweeter. The tweeter is directly above the midbass driver, the bottom of the tweeter housing carefully contoured to deflect and radiate the sound uniformly in all directions. A similarly contoured, spoon-like deflector above the tweeter disperses the tweeters output in like manner. So instead of two driver arrays projecting sound in two opposite directions, the Omniguide permits a single set of drivers to more uniformly disperse sound in all directions. And because the Omniguides are canted forward, more sound energy is radiated forward than to the sides, and the least sound is directed behind the speaker. Because bass frequencies are more or less omnidirectional, only the tweeter and midbass drivers are part of the Omniguide module; the OMD-15s single woofer is mounted on the front baffle, just below the passive midbass radiator. A lot of technology and high-quality design are packed into the OMD-15s stylish and relatively compact cabinet. While its drivers are smaller than those used in Mirages top OMD model, the OMD-28, and arent woven of that models ultracool, multilayered carbon fiber, theyre still highly advanced proprietary designs. The OMD-15s 1" dome tweeter is a Pure Titanium Hybrid, its 5.5" midbass driver a Poly Titanium Deposit Hybrid. The latter is loaded with a 5.5" passive radiator on the front of the cabinet, and just below it is another 5.5" Titanium Deposit Hybrid driver, which acts as a woofer and is enclosed in its own chamber with a downward-firing port. Both of the 5.5" drivers as well as the passive radiator use Mirages patented Ribbed Elliptical Surround, designed to decrease deformation of the surround and thus reduce distortion while permitting greater cone excursion. The OMD-15 rests on four short legs that separate it from the base plate; this hides the port from view and gives its output room to escape. The front grille attaches with conventional pressure-fit tabs, the domed top grille with magnets. Near the bottom of the rear panel are two sets of gold-plated five-way binding posts that can be used for biwiring or biamping. The OMD-15 doesnt look as cool as Mirages classic monolithic M-series speakers, but its attractive in its own right. Not everyone will be crazy about the slanted top, or the hemispherical grille that covers the Omniguides, but I found the OMD-15s sleek cabinet, its gentle side panels curving around to the rear, to be elegant and striking. 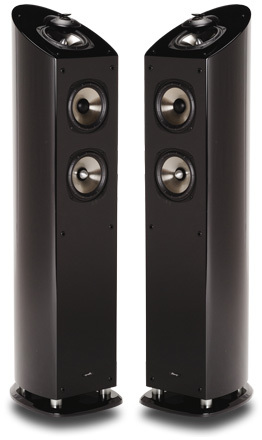 My review samples were finished in an attractive high-gloss black; the speaker is also available in a high-gloss veneer of genuine rosewood at no additional cost. Mirage includes gloves and a polishing cloth to help keep the speakers finish gleaming. The quality of the finishes is impressive, and admirable at this price. All in all, the OMD-15 is a premium loudspeaker at a real-world price. I set up the OMD-15s in my usual reference rig: a Trends Audio UD-10.1 USB converter or Oppo DV-970HD as sources, and an Anthem D2 audio/video processor used as a D/A converter and preamplifier. Power amplifiers were the Bel Canto e.One REF1000 monoblocks or an Axiom Audio A1400-8. Cables were by Analysis Plus and DH Labs, and all power cords were made by Essential Sound Products, plugged into either a ZeroSurge 1MOD15WI or Torus Power RM 10 power conditioner. You might, as I did, suspect that the OMD-15s Omnipolar radiation pattern would have made it especially sensitive to placement. It did and it didnt -- I was surprised to discover how good the speakers sounded in a wide range of locations. Whether only 1 away from the screen of my 56" rear-projection TV, or placed slightly off-center in the room -- or even when listened to from a couple of feet away from the sweet spot -- the OMD-15s still sounded pretty good. The imaging never suddenly collapsed to the position of a single speaker, as often happens with more conventional designs. With the OMD-15s in all of these positions, I still heard a solid center image and decent soundstage depth, though these diminished the farther the speaker placements or my listening position deviated from the ideal. In short: You may have to spend some time positioning the OMD-15s before you get from them their absolute optimal performance, but its quite easy to get most of that performance with only minimal effort. After a fair amount of experimentation, I found that the OMD-15s produced the best combination of image specificity and soundstage depth and width when placed a couple of feet from the sidewalls, about 3 from the front wall, and slightly toed-in. One of the OMD-15s strengths was its treble, which was extremely smooth. The steely guitars on "Yer So Bad," from Tom Petty and the Heartbreakers Playback [CD, MCA 6-11375], were sparklingly clear and free from harshness. Some systems can make harmonicas sound shrill, but on Pettys "Mary Janes Last Dance" the instrument was engaging and articulate without sounding too prominent. Words & Music: John Mellencamps Greatest Hits [CD, Island 000359202] can sound a bit bright through some systems, but not through the OMD-15s. My favorite track, "R.O.C.K. in the U.S.A.," was reproduced with clarity and authority. The vocals, strings, and percussion were wonderfully defined, with precisely the right amount of cowbell set slightly back on the stage. The OMD-15s bass reproduction was as finely balanced as its high-frequency performance. The massive drums on Dadawas Voices from the Sky [CD, Warner Bros. 18768] filled my room with authority and a decided lack of boom. The effect was thrilling -- I could feel the bass nearly as much as I could hear it, but this wasnt one-note boom. Ultimately, I would have preferred just a bit more downward reach and definition, but that level of performance is usually found only with much larger, more expensive speakers or high-performance subwoofers. For what is essentially a small floorstander, the OMD-15 produced an amazing amount and quality of bass. With more natural-sounding recordings -- such as Tom Pettys Playback, which lacks the immense bass of the Dadawa CD -- the kick drum had a tightness and grip that were realistic and visceral. Voices sounded magnificent through the OMD-15s, floating between them in a way I have rarely experienced with other speakers. Because their soundstage was both deeper and higher than Im used to, the OMD-15s sound seemed more like that of an actual three-dimensional space, rather than two speakers simply reproducing the usual flat image of a two-channel recording. Eric Claptons voice on "Hey Hey," from Unplugged [CD, Reprise 45024-2], was slightly to the right of center, inside and behind the plane of the two very distinct guitars. The purity of Ayoko Hosakawas voice on her cover of Claptons "Tears in Heaven," from the compilation Five Songbirds [SACD, First Impression Music FIM 4892843000936], was stunning -- the OMD-15s clearly demonstrated the superiority of this hybrid discs SACD track to its "Red Book" CD track. Dadawas Sister Drum [CD, WEA 745099959227] also has plenty of bass, as well as some unforgettable vocals. The OMD-15s placed the title tracks main vocal -- someone singing so softly as to be almost speaking -- dead center between them. A more melodic and sorrowful wailing was far back and to the left, while an eerie muttering could be heard farther forward and hard right. The cumulative effect was a deeply layered, holographic soundstage that sounded downright spooky. While the OMD-15 is the best speaker Ive heard from Mirage, I admit that I have not yet heard their more expensive statement OMD-28 ($7500/pair), and Im not including the OM-1 prototype (+$20,000/pair), which never made it into production. In his review of the OMD-28, Doug Schneider mentioned that Mirages classic M1 and M3 speakers, and many of their other bipolar designs, were often described as sounding very spacious but rather dark, which I tend to agree with. The OMD-15 did have a spacious sound, but little coloration that I could hear. In fact, it sounded exactly as Id expect a well-designed and well-engineered modern loudspeaker to sound. Compared to the much larger, more expensive, original Paradigm Reference Signature S8 ($5400-$6000, depending on finish; discontinued), the OMD-15 couldnt play as loud or with the same impact, especially in the lower frequencies. Dadawas Voices from the Sky filled my room; the S8s gripped that albums bass with a tightness the OMD-15s simply couldnt match. To its credit, the OMD-15 didnt let the bass get loose or boomy; there was just a little less of it. The Paradigms could also play louder overall -- and with my Axiom A1400-8 amplifier, I could play the S8s insanely loud. I was able to play the OMD-15s at volumes that would make some question my sanity, though not quite to the S8s neighbor-and-spouse-annoying levels. Even so, I was thoroughly impressed by the OMD-15s power handling and ability to play loud with little distortion. Through the midrange and the treble, the OMD-15 shrank the performance gap between it and the Paradigm S8. Both speakers had smooth, extended highs that some might describe as "sweet"; Id say they were equally neutral, sounding neither tipped up nor rolled off. Voices, too, sounded wonderful through both speakers. Originally recorded in analog in 1971, Neil Youngs Live at Massey Hall [CD/DVD, Reprise 093624332725] is one great-sounding recording in 24-bit/96kHz sound. Both speakers sounded sublime playing "A Man Needs a Maid/Heart of Gold," but the OMD-15s placed Youngs voice slightly back in the soundstage, while the S8s held it nearly parallel with the plane of the speakers, which added some immediacy. The whispered lyrics of "Heart of Gold" were especially clearly reproduced by the S8s, but the OMD-15s countered with a more natural presentation of the sound of Massey Hall itself, making Young sound as if he really was performing live at Massey Hall. Both speakers placed the piano behind Youngs voice and across much of the soundstage -- but again, the OMD-15 placed it slightly farther back. The Paradigm S8s exhibited excellent imaging, but couldnt place instruments and voices in three dimensions as well as the OMD-15s did. The Mirages soundstage was slightly larger, the images of voices and instruments farther apart. The walls of my listening room didnt exactly "disappear" -- the room seemed larger in all three dimensions, but not unnaturally so. The S8s did reproduce image outlines with somewhat greater precision, which I liked. In my room, though, even the S8s couldnt produce images with laser-like precision. For example, while Eric Claptons voice on his "Tears in Heaven" sounded relatively focused through both pairs of speakers, through the Mirages it emanated from slightly farther back and to the right. As soon as I hooked up the Mirage OMD-15s, I could tell that they were excellent speakers, period. I dont qualify that by saying that the OMD-15 sounded great for an Omnipolar speaker, or that I somehow had to get used to the "Omnipolar sound." Ive listened to many great-sounding Mirage loudspeakers over the years, some direct-radiating, some bipolar, and some Omnipolar. The OMD-15 is the best Ive heard yet. While it lacks the razor-sharp imaging some audiophiles crave, its also true that many direct-radiating speakers dont produce ultraprecise, pinpoint images either. Its also a tad laid-back, but its deep soundstage extends well behind and to the sides of the speakers -- and there was even a sense of height. Before I received the OMD-15s, my previous experiences with Mirage speakers had already predisposed me to like these. And I did end up liking them, but not for the reasons Id expected to. Yes, they had that uncanny ability to re-create a sense of space and that "big" sound that Mirage speakers are known for, but for me, those were not the OMD-15s most impressive attributes. Instead, I found the OMD-15 to be an exceedingly well-balanced design that embodies all of the qualities of a true high-end loudspeaker. Anyone looking for a speaker at or near $2500/pair should audition the Mirage OM Design OMD-15. Whatever your preconceptions about Omnipolar speakers might be, whether good or bad, I think youll be pleasantly surprised by the OMD-15. You might even find them irresistible.